After some feedback the PDF got updated and some errors were fixed. Elidis, who already created some beautiful stuff for the German fan community published recently his Player support sheets for the German Earthdawn 4th Edition. When I asked him if he could provide his sheets in English too, he was so kind to translate the sheets. And how it goes, I am now able to present you his cheat sheets for Earthdawn 4th Edition: ‘Character Creation and Development’ and for Players the ‘Players guide light’ PDFs. Die deutschen Fan Downloads ‘ED4-Charaktererschaffung’ und ‘Spielerhilfe’ von findet ihr bei Ulisses Spiele hier (unter ‘Als PDF bestellen’-Button – Downloads) oder hier (im Suchfilter einfach auf ‘Earthdawn’ (ganz unten) filtern). Habe gerade feststellen müssen, dass die Fan-Downloads von Elidis bei Ulisses Spiele gut versteckt sind. A propos Ulisses Spiele: einen Blick auf die deutschen Bücher (inklusive limited ESPAGRA Version!!) könnt ihr hier werfen. The recently released official Earthdawn character sheet was not very well received by many fans. Well, experience shows that many fans prefer to design their own character sheets , as these then most likely meet their requirements. Be it optical or simply useful criteria. A criteria for me is for example to have editable PDF’s, to capture Attributes, Talents, Skills or Spells. Others prefer sheets where you can capture everything up to high circle characters and so on, but what about stylish or well designed sheets? One fanmade Earthdawn 4th Edition character sheet was already introduced on the blog, even before the official release was made. But it’s design is rather minimalistic and focused on printability. Do you remember the editable scroll-design-sheet that was released on the Earthdawn blog on 2013? Yes, again it is Patryk aka UglyGoblin that contacted me with another approach to publish an editable stylish Earthdawn 4th edition character sheet. Good news for our polish readers! Patryk has already created a Polish version of his sheet in addition to the English version. A German translation is in the making. The Himmelsstürmer - a group of young adepts who was distinguished by all the virtues that you can think of: courage, kindness, curiosity and adventurousness. Your treasures? A mirror which - a wild collection of useful, magical items, for fighter craft and sorcerers alike. 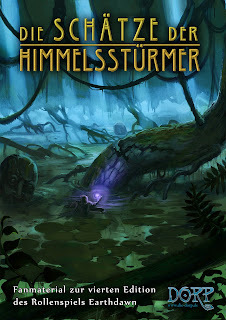 The treasures of Himmelsstürmer collects on 16 pages the magical treasures of our last campaign, provided with descriptions and aligned with the brand new rules of the fourth edition of the role-playing game Earthdawn.